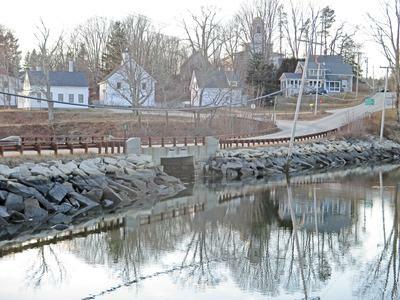 The Maine Department of Transportation will replace the Benjamin River Bridge at the Brooklin-Sedgwick town line. Construction is expected to begin on February 18 and traffic will be detoured during the three-month closure. Photo by Jeremiah Savage Order prints of selected PBP photos. The Maine Department of Transportation will replace the Benjamin River bridge at the Brooklin-Sedgwick town line. Construction is expected to begin on February 18 and traffic will be detoured during the three-month closure. Detours are marked with arrows and bridges are labeled. The Benjamin River Bridge, which spans the river at the Sedgwick-Brooklin town line on Route 175, will be inaccessible from February 18 until May 18, causing detours for motorists. The $1.5 million project will replace the bridge, which was built in 1935, and rebuilt in 1965. According to the Maine Department of Transportation, the bridge is being replaced due to poor condition including erosion around the pilings and bridge abutments and deterioration of both the concrete and steel reinforcements of the bridge. The new bridge will be two feet higher and significantly longer than the previous bridge, raising the grade by two feet overall. The structural changes are meant to mitigate flooding, a perennial problem in the area, and account for projected sea rise. During the construction, traffic will be detoured around the site. Two primary detour routes have been identified. The first involves a five-mile detour up through Hales Hill Road. The route involves crossing a small bridge, which was not built to withstand heavy loads. The second is a 20-mile detour through South Blue Hill. This road follows Route 175 to Blue Hill, crossing the Falls Bridge, which is the site of a different proposed MDOT bridge project. This bridge has been posted for heavy loads exceeding 25 tons.